Wagyu tartare / oyster - always something interesting and enjoyable from David. Nice chunks of wagyu means a little more bite and texture, and of course the oysters bring something completely different to the flavor profile. Nice tomato wedges and zucchini flowers add a nice touch, and simply finished with olive oil and ground pepper. Baby razor clams / pork belly / red chili - I saw pictures of baby razor clams on social media over the last week as friends visited the place. I've never had them this small, so I was definitely curious. Our Japanese friend had never come across razor clams at all, so this was a totally new experience for him. The crispy slices of pork belly were, of course, very welcome in my book. I gotta say that I really loved this dish... The sweetness of the razor clams, drenched in what seemed to be a buttery sauce where lemon juice provided the acidity to cut the richness... and accented with some kaffir lime leaves and chili flakes. Firefly squid / borlotti beans - this was the "upgraded" version of the dish I had earlier this month... now made with firefly squid (蛍烏賊) from Toyama Prefecture (富山県). Soooo yummy... and that rich sauce made with squid ink... Loooooved the peppers and the acidity they bring to the dish, and in fact the flavors matched the reds pretty well. Grilled fish head - one of two "daily specials" that David had reserved for us. This was half of the head of a fourfinger threadfin (馬友), which is a fish that I'm very fond of these days. There is a little bit more fat underneath the skin, and the flesh is very fine and tender. Instead of serving it fresh, they decided to salt it for half a day in the tradition of 咸鮮 - where the salt brings out the flavors of the fish. What this meant, though, was that the fish was a little more salty than we were expecting - especially on the parts with skin. H-man and I shared the collar - with me taking the parts with the skin - and I saved him the chunk of meat from the cheek. Nicely done with garlic cloves and fennel branches. Thankfully no one objected to my garlic breath... probably because the alcoholic fumes were much more overpowering at the end of the evening. Roasted Pyrénées lamb shoulder - oh yes, more garlic! These 3-week old milk-fed lamb come from the same source that supplies Amber, and I just had the most delicious lamb shoulder a few days ago. While the lamb was very tender tonight, I thought it was a tad overdone. Surprisingly, I really enjoyed the potatoes... and of course the smoked garlic on the side. 36 months Comté "Bernard Anthony" - always beautiful. Brie de Meaux "Alléosse" / black truffle - what's not to like?! 1998 Jacques Selosse Brut, dégorgée à 7 Fevrier 2007 - what a beautiful wine! Interestingly, not a lot of carbonation here... just some very fine bubbles... almost like a still wine! Nose was not surprisingly very much like salty plum (話梅), savory, with minerals, and also sweet and caramelized, with some honey. Really opened up well after more than an hour. 2001 Dujac Clos de la Roche - we decided not to decant this even though a friend had made the suggestion. Nose was a little fragrant, with nice fruit and a little bit of toast as well as a hint of minty notes. Later on it showed a little animal and leather notes. Nice acidity balance here. 2004 Ponsot Clos de la Roche - we put this in a decanter per a friend's suggestion, and even past the two-hour mark the wine was not revealing too much. Yes, there was some fruit here, and some animal notes, and even a little metallic. I thought the 2004s would be pretty ready to drink now, but this was just not ready. At all. 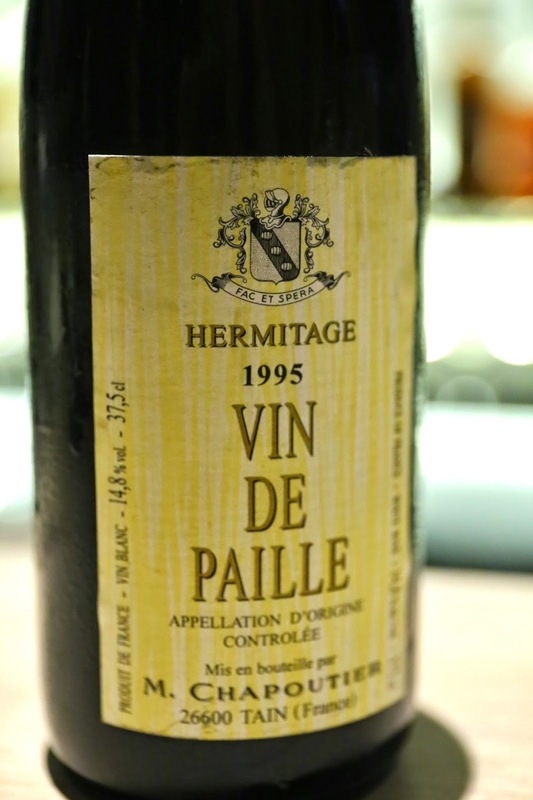 1995 Chapoutier Hermitage Vin de Paille, en demi-bouteille - always one of my favorite sweet wines, now at 20 years of age. Yeasty, with orange marmalade, a little nutty, certainly straw and slightly vegetal, with some toasty corn, too. Sweet on the attack but actually not too sweet mid-palate. Nice acidity here. A really, really fun evening for a group of friends who've known each other for close to 2 decades. Hopefully, we will meet each other in 6 months as planned - in Macau!